When lean manufacturing or warehousing matters: Conveyor systems by nature flatten the “movement curve” of a load as it travels through a facility. Conveyors are an excellent way to straighten production lines and enforce lean principles, since they dictate how products are handled and moved. Roller conveyors are a key way to implement lean principles in virtually any operation. When space is tighter. Product is quickly and efficiently moved through a compact area, eliminating wasted space for carts or forklift aisles. In some cases, conveyors can be ceiling mounted, completely freeing up floor space for other equipment or operations. When product damage is becoming an issue. Conveyors are naturally easier on the loads than repetitive loading and unloading of carts, trucks, or forklifts. When time is critical. The time lost when employees are assigned to retrieve the next cart in the process. Employees with tasks at a machine or picking area must find an empty cart, taking them (and their focus) away from the task at hand. When conveyors are the transport method, this step is eliminated. Operators searching for anything – whether it’s carts, tools, packing materials, or other needed equipment – are at a severe productivity disadvantage. The time lost is substantial. In very low volume operations where the conveyor’s ROI is questionable. Carts can be the solution for facilities with multiple elevations, although a conveyor system can be configured to work around most of the problem layouts. In older facilities where power or other restraining factors are present, carts may present some advantages. Carts provide flexibility to move products between areas that a pre-destined conveyor line cannot. However, many operations find that flexibility to also be available within a conveyor system by implementing manual carts in instances where this is desired. 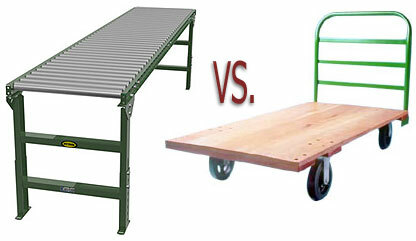 Carts are frequently used in conjunction with conveyor systems. Work in process areas can have a few carts assigned to help deal with situations the main conveyor layout cannot (or with changes after the conveyor implementation). Employees can use carts in situations where a temporary need must be fulfilled. If you are transporting very large parts in a compact footprint, there are situations where a cart can be used more effectively than a conveyor. However, the ergonomics of loading and unloading the cart are an issue. In tight spaces, the cart may be more maneuverable than a conveyor system for large components, provided they can be loaded or unloaded safely.